Stilettos on Lex is one of three fragrances offered by new niche line Jul et Mad and the first episode in the collection's "Histoire d'Amour." On the one hand, honestly, I'm a little weary of fragrance collections with destination themes and love-story themes. On the other hand, Jul et Mad describes Stilettos on Lex this way: "A haunting, captivating perfume… Its powerful yet refined personality enchants the lovers of timeless floral fragrances with a powdery touch. Nothing and no one can resist it, by day or by night. This enveloping perfume is a real 'séducteur,' pure reflection of the beautiful and mysterious silhouette encountered on this legendary New York City avenue..." "Lovers of timeless floral fragrances with a powdery touch"? That would be me. A New York reference never hurts, either. 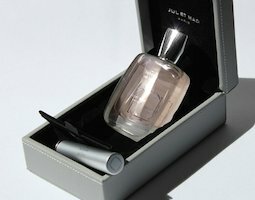 The composition of this "chypre fruity floral," developed for Jul et Mad by perfumer Dorothée Piot, includes top notes of lemon, pear, davana and plum liquor; heart notes of lily of the valley, violette leaves, rose absolute, heliotrope, iris and carnation; and base notes of musk, Madagascar vanilla, Indonesian patchouli and Atlas cedarwood. Its story is "the portrait of a woman, mysterious and beautiful, in New York City" or, more specifically, the impression she leaves on a bewitched onlooker. It's certainly a feminine fragrance, although I'd think of it more as a "sophisticated fruity-floral" than a chypre. It opens with a very quick bite of pear, followed by a jammy plum note and a long-lasting, aldehydic violet. There's a sharp cedar edge that seems to signal a transition into the heart notes. There I can smell a quietly rich rose note with a blend of other classic, glamorous florals. This isn't a rose scent, specifically, nor an iris or carnation scent, but the floral notes are there, smoothly interwoven. The drydown of Stilettos of Lex is powdery, but not as powdery as you might expect. (We're nowhere near Teint de Neige territory here, or even Love, Chloé.) It leaves a lasting impression of a very soft heliotrope-and-sandalwood accord, although the plum and the florals don't quite disappear. If you like fragrances such as Bond no. 9's Broadway Nite (rose, violet and vanilla) and By Kilian's Liaisons Dangereuses (plum and other fruits, rose, cedar, vanilla and musk) but find them a bit "much" to wear on a regular basis, you may very well like Stilettos on Lex. It still has a romantic-fantasy aspect, but it's easier to carry off than either of those fragrances, both of which can feel a bit too bright and brash. Stilettos on Lex, on the other hand, begins in vivid jewel tones and gradually deepens into more muted colors and then sepia — like a fading photograph, or even like the memory of a stylish woman passing on the street. Jul et Mad will soon be opening a web-shop on the company website, and the collection will be arriving at Aedes de Venustas in mid- to late September. Stilettos on Lex is available as Parfum; it sells for $280 for a 50 ml bottle accompanied by a 7 ml "Nomad Perfume" travel atomizer. 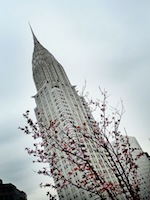 Note: top left image is Blossoms and Chrysler Building 1 by hajime7 via flickr; some rights reserved. I love both Broadway Nite and Liaisons Dangereuses — though I confess I don’t find LD “too much” at all. Guess it takes a lot to shock me?! Broadway Nite I think is fab but definitely not an everyday scent. This sounds quite nice actually. E, I do have a soft spot for Broadway Nite, although sometimes it feels like a sparkly cocktail dress that just doesn’t work for more casual occasions! I like it best for evening or for cold weather (just one spritz in the daytime). DL is my favorite Kilian, but I still don’t own bottle. It somehow always seems to be wearing *me*, rather than the other way around… my usual experience with that line! The packaging is very nice and that it’s the same perfumer that made Memoir Woman is promising. Pricey though! The packaging is even nicer in person, I’m happy to say! The box is lovely—it’s covered in a pale green-gray leather, and it can also be used for jewelry or other precious little things. It’s certainly not a bargain line, but the products are high quality (and pure parfum!) and it’s a small company, so I somehow don’t mind so much. Then I hope you’ll have a chance to try this! I wish they offered a sample-vial set. That would be ideal. Wow, you act fast! Didn’t Robin just posted about establishment of this new niche line? I’m impressed! Seems like an interesting, well-edited line. I’m so thankful for new lines that don’t launch a dozen of perfumes at once. Thank you, Jessica! Something new to discover. V, I agree — when a new line comes out with eight or nine fragrances at once, my eyes glaze over. It feels like too much work for me to sort them all out at once! I hope you’ll have a chance to try these. I’m enjoying the second one, too — it’s Paris-themed.